Great for anyone who enjoys horses, western wear, or even just a little bit good luck. 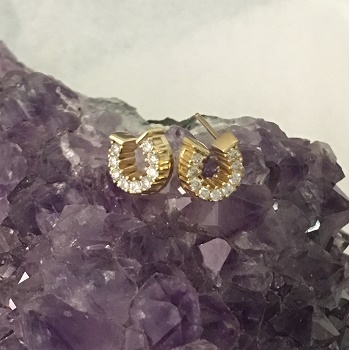 Horseshoe earrings that offer a right and a left. The coolest thing is that they hang upright unlike most that you'll see. Set in 14kt yellow gold with .25ct of matching full cut diamonds. Request locking or screw backs below to insure security! Extra charges will apply.